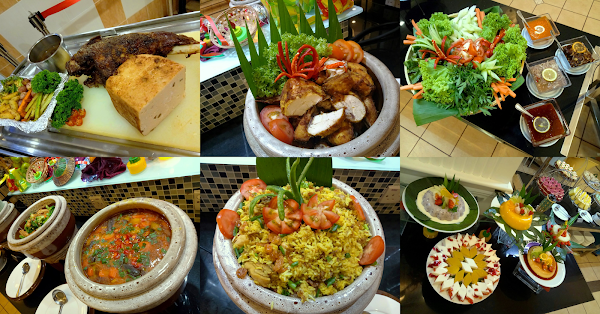 Special thanks to Bayview Hotel Georgetown Penang for extending this food review invitation. 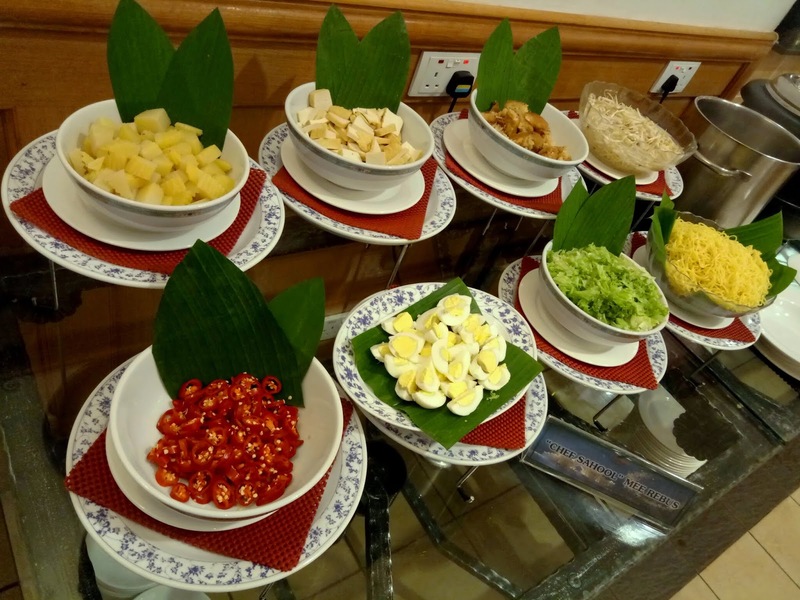 While Bayview Hotel Georgetown Penang served Thai dishes for its Ramadan buffet dinner last year, the hotel is serving Malay food this round. 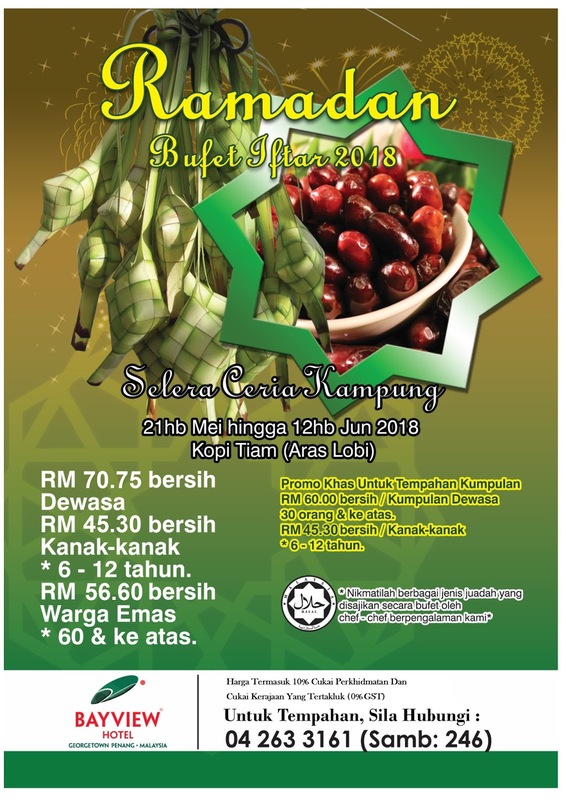 This year's theme is "Selera Ceria Kampung". 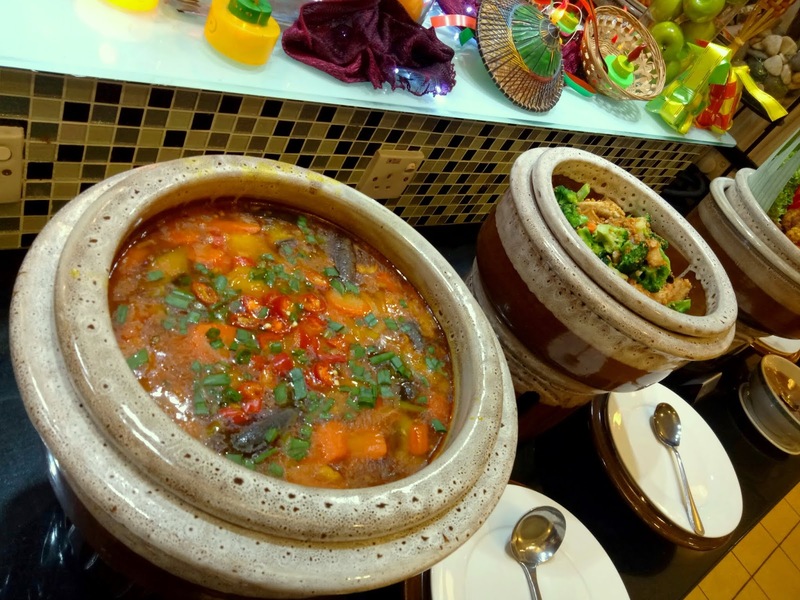 Held at Kopi Tiam, the buffet features several signature dishes that are inspired by famous recipes around Penang and throughout Malaysia. 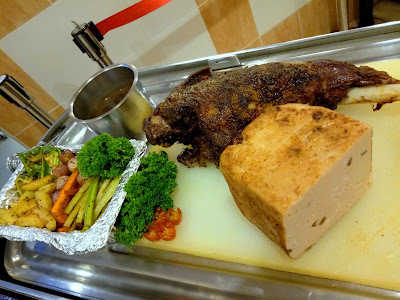 Kambing Kampung Panggang is served at the carvery. The mutton is grilled well as its natural juices are kept intact. The Chicken Meatloaf is pretty appetizing too. Grilled vegetables and black pepper sauce are provided. 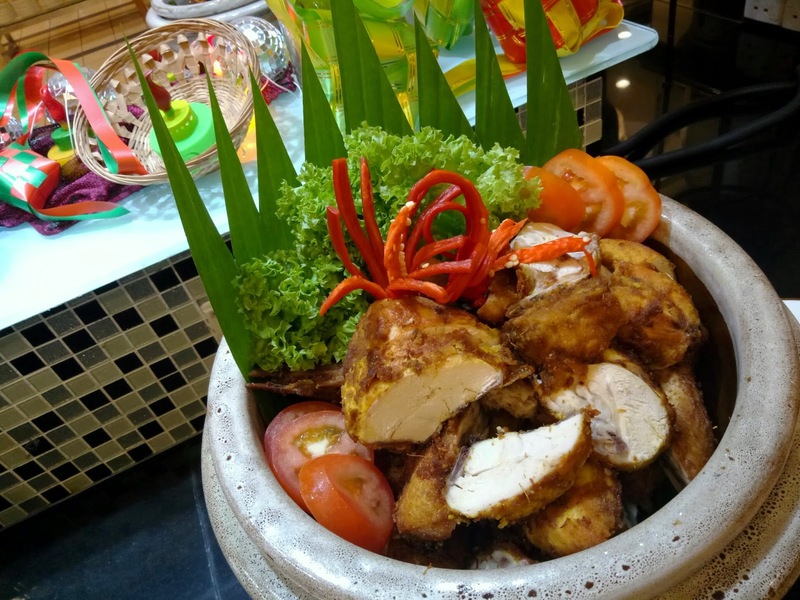 Other delicacies from the grilling station are Satay Ayam (skewered chicken) and Satay Seafood (skewered seafood). Today's noodle station serves Chef Sahool Mee Rebus. This dish uses yellow noodle with sweet and sour gravy. Other ingredients for Mee Rebus are cucur udang (prawn fritters), hard-boiled eggs, potatoes, tofu, lettuce, bean sprouts and red chili peppers. Should diners prefer something spicier, Tom Yam Kung (ต้มยำกุ้ง, Thai-style prawn curry) is also prepared today. Gurney Drive Sotong Kangkung is another appealing delicacy today. 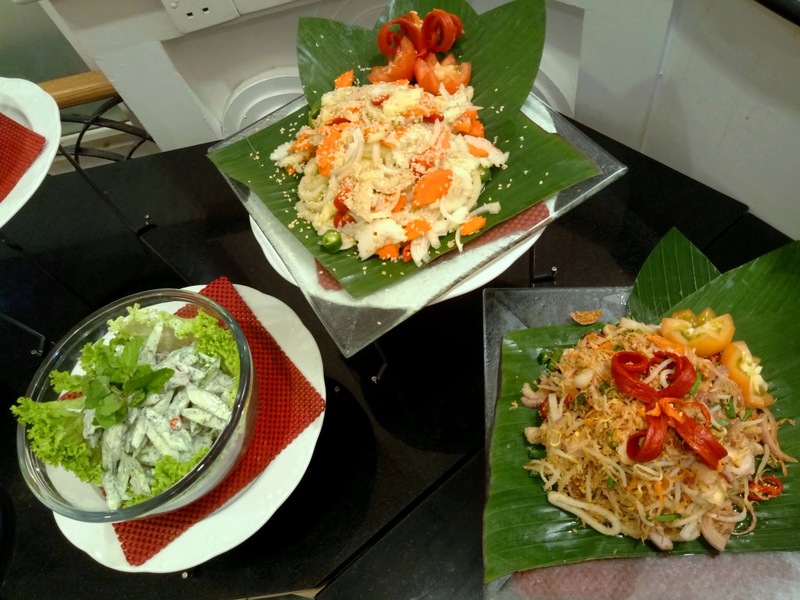 The salad comprises of cuttlefish, water spinach, crab sticks and sweet-savory dressing. Ground peanuts and sesame seeds are sprinkled on top. Other delectable local favorites are Rojak Padang Kota Lama and Padang Kota Baru Mua Chee. Ulam-ulaman consists of assorted vegetables like kacang botol (winged beans), daun selom (selom leaves), tomatoes, cucumbers and lettuce. 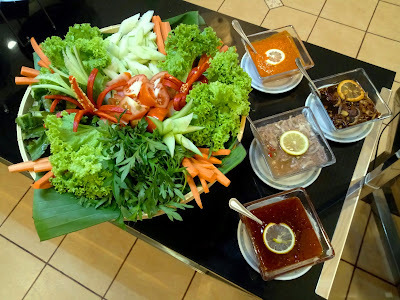 The raw vegetables are usually consumed with condiments like sambal belacan (spicy shrimp paste), sambal kicap (spicy soy sauce), cincalok (fermented shrimps) and sos cili Thai (Thai chili sauce). 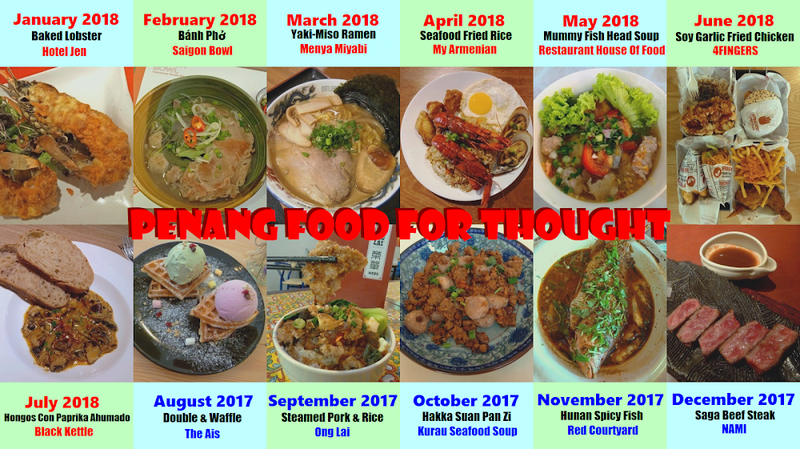 Other dishes worth trying are Kerabu Taugeh Dengan Sotong (squid and bean sprout salad), Acar Mentah Mat Gebu (pickled cucumber, carrot and onion salad), Salad Telur Dengan Epal Ala Thai (Thai-style omelette with apples), Cucur Udang Dengan Kuah Kacang (prawn fritters with peanut sauce), Nasi Impit Dengan Serunding Daging Lembu (pressed rice with beef floss) and Timun Raita (cucumber with yogurt dressing). 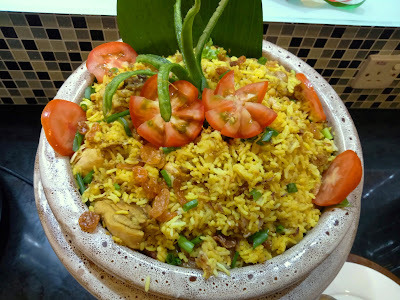 Bayview Nasi Ayam Briyani is the hotel's signature rice dish. Unlike many restaurants, Kopi Tiam prepares it by cooking the rice with chicken broth and chicken chunks. This results in a lovely aroma that induces appetite. The rice tastes good too. I also enjoy intermittent sweetness from raisins. 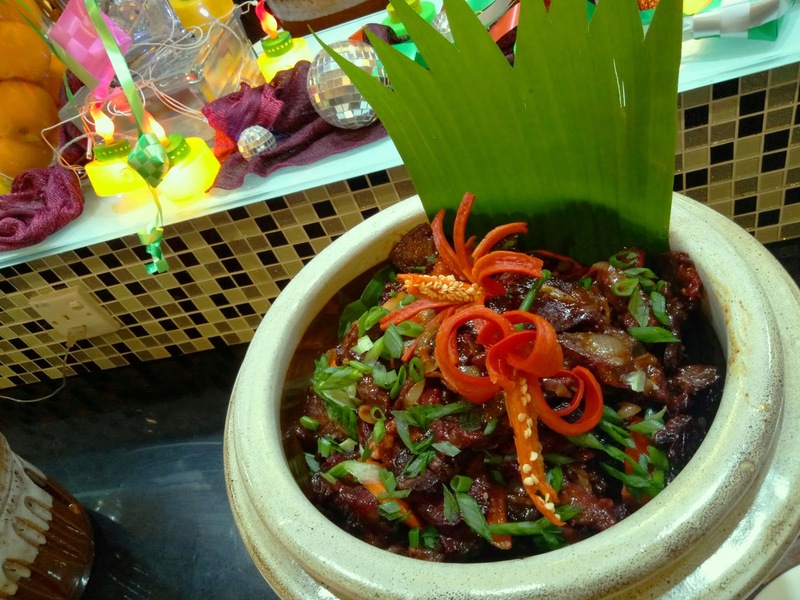 As for Daging Merah Ala Paprik, the beef slices are cooked with flavorful spices. As the beef is quite pungent, it pairs well with briyani rice. The dish's red color comes from red chili peppers. Another equally spicy dish is Gulai Nangka Muda Dengan Nenas Kuala Muda (jackfruit curry with pineapples). Dalca Sayur Lorong Madrasah is one of my favorite dishes here. The vegetable curry is loaded with carrots, potatoes, cabbage and other vegetables. As the spiciness level is relatively mild, the curry can be can be eaten directly even without rice. Another vegetarian dish is Sayur Goreng Broccoli Dengan Tofu Dan Cendawan Brinchang (fried broccoli with tofu and mushrooms). Moving on to poultry, Ayam Kampung Goreng Ala Sarawak Dan Sambal is served today. The fried chicken has browned skin with white flesh underneath. Since the chicken's taste is quite bland, it is served with spicy chili paste. If you like the tender texture of catfish, Ikan Keli Goreng Bersambal Jalan Kedah should appeal to your palate. 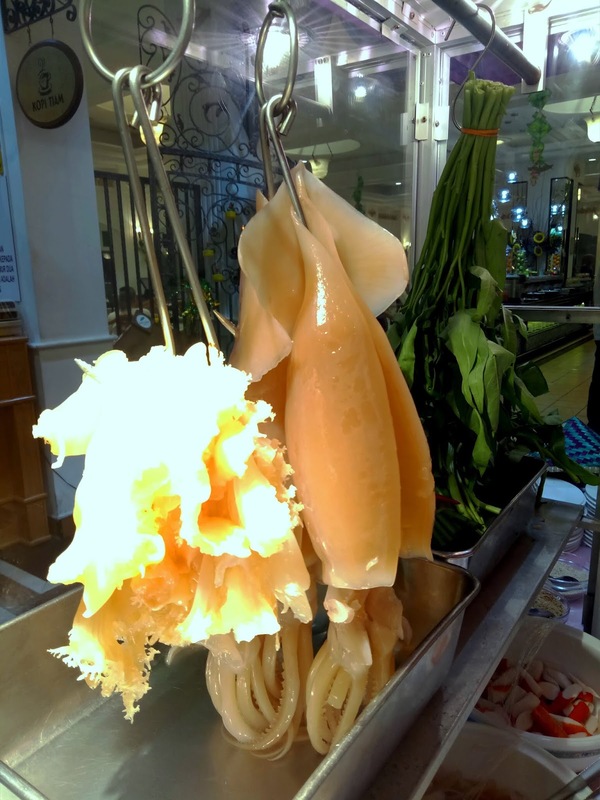 The fish is dressed with sweet and spicy sauce. 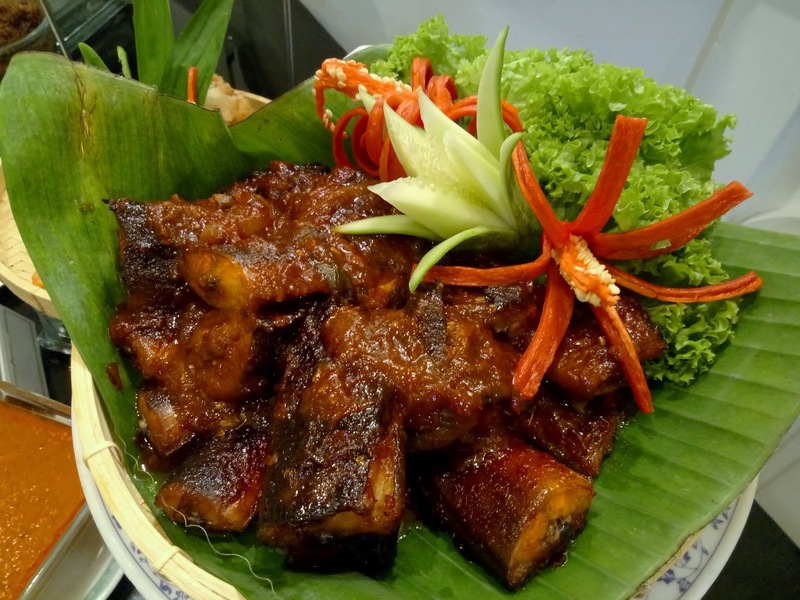 Other seafood dishes include Ikan Cencaru Sumbat Sambal Tanjung Tokong (fried mackerel stuffed with chili paste), Udang Goreng Dengan Telur Masin Dan Daun Kari (fried prawns with salted eggs and curry leaves) and Siput Mussel Masak Tumis Bercili (mussels with chili paste). 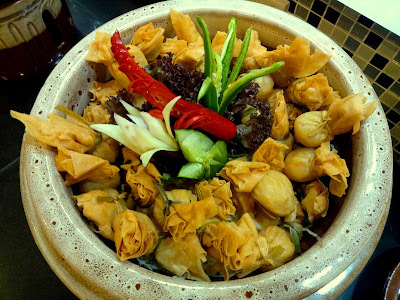 Seafood Wanton is one of the deep-fried items on today's menu. The deep-fried dough skin contains minced seafood and seasonings. Satay Wanton is also prepared today. There are 3 pieces per skewer. Hailing from Terengganu, Cucur Lekor is made from ground fish and sago flour. 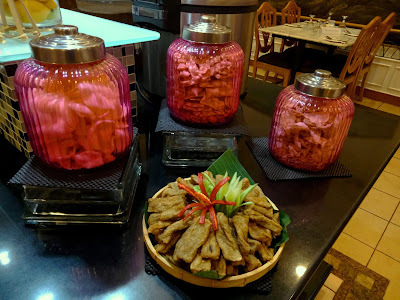 The deep-fried snack has a chewy texture and is usually eaten with sweet chili sauce. Other delectable crackers are Keropok Udang (prawn crackers), Papadom (black gram crackers) and Merinjau (belinjo nut crackers). 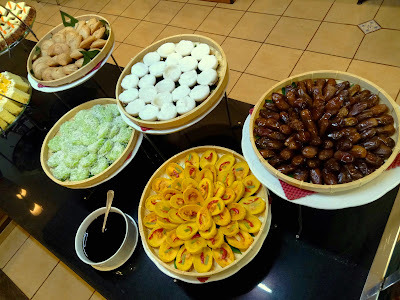 Kopi Tiam's desserts section contains several types of Kuih Muih Melayu. Shown here are Kuih Cara Berlauk (spicy cupcakes), Kuih Talam Gula Merah (brown sugar layered cake), Karipap (curry puffs) and Onde-Onde (glutinous rice balls with palm sugar syrup). 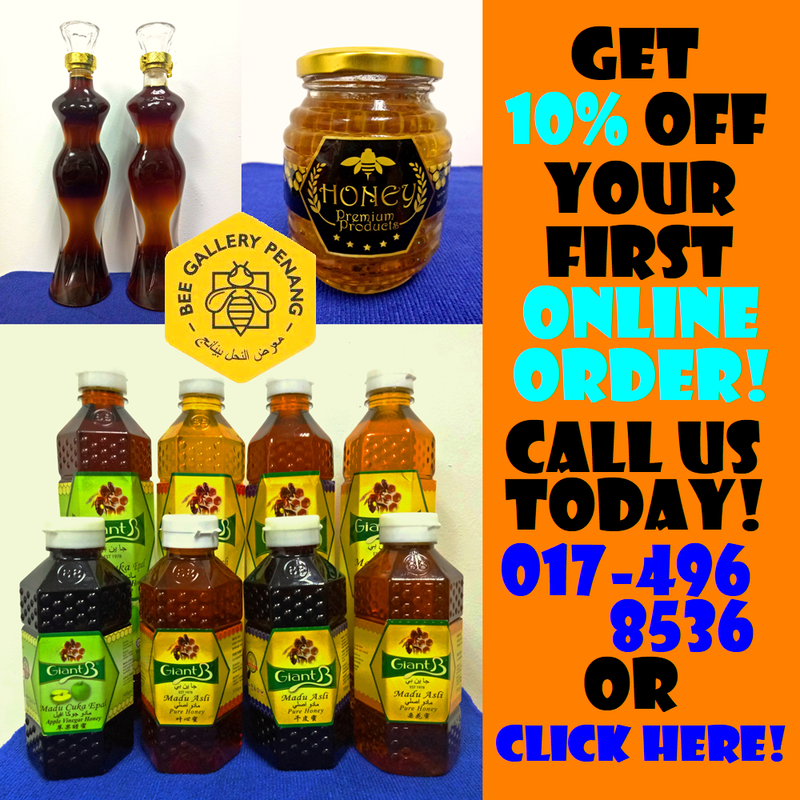 Buah kurma (palm date) is ideal for satiating hunger after fasting for more than 14 hours. In addition, Bubur Kacang Hijau (mung bean soup) is also perfect for breaking fast. As for Western pastries, the pastry chef has prepared the signature Carrot Cake, Red Velvet Cake and Orange Butter Cake. 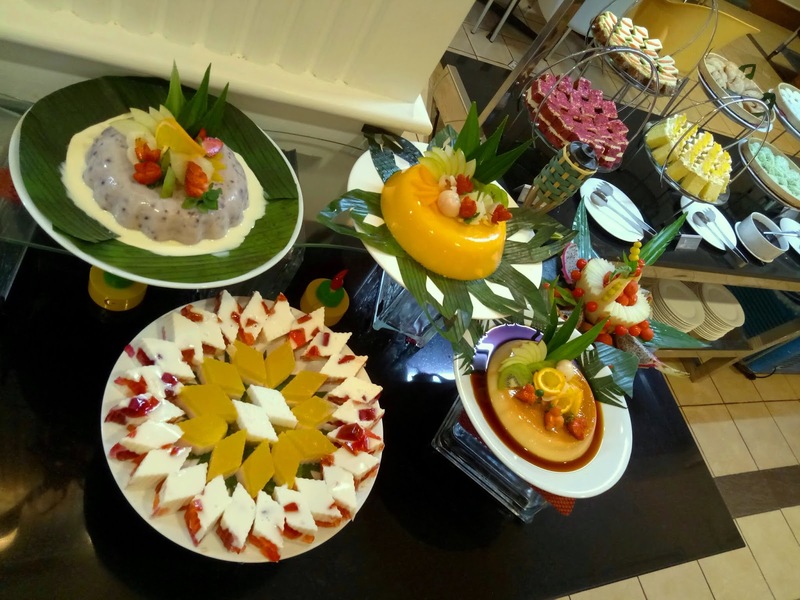 Other desserts to satisfy everyone's sweet tooth are Crème Caramel, Mango Custard, Red Bean Pudding and Agar-Agar. Last but not least, Lebuh Keng Kwee Cendol is inspired by a popular stall near Penang Road (Jalan Penang). 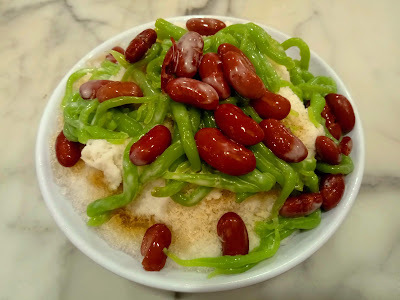 The shaved ice is flavored with jelly noodle, kidney beans, gula melaka (palm sugar) and coconut milk. Bayview Hotel serves Ramadan buffet dinner from 21 May 2018 to 12 June 2018. There are 3 menus on daily rotation. Nearly all dishes are changed every day. 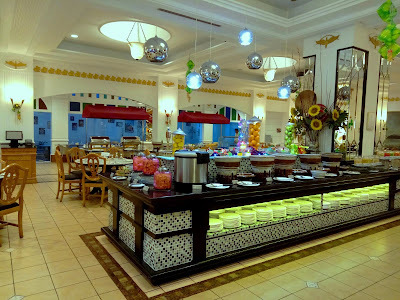 The buffet is priced at RM70.75 net for adults, RM43.50 net for children (ages 6 to 12) and RM56.60 net for senior citizens (ages 60 and above). Directions: Bayview Hotel is located at Leith Street (Lebuh Leith), between Lebuh Farquhar and Jalan Sultan Ahmad Shah. 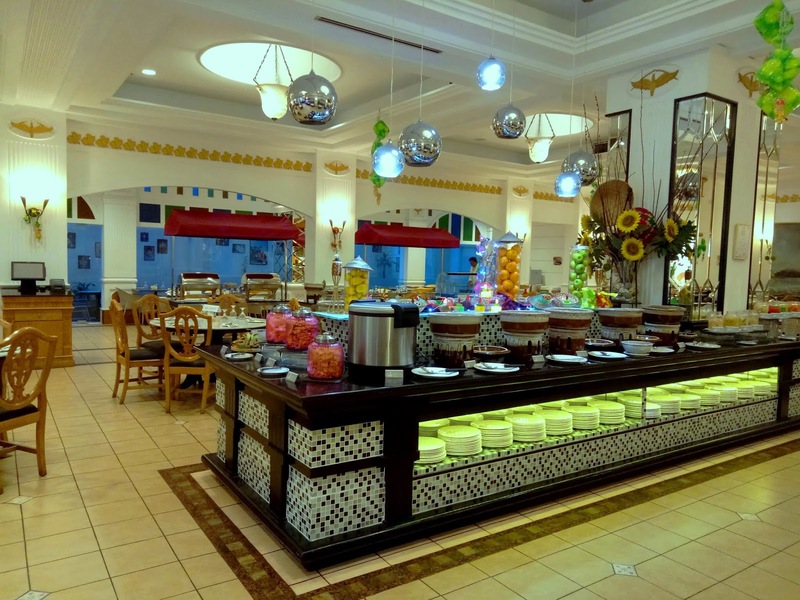 Kopi Tiam is located on the Ground Floor and next to the lobby. The hotel's multi-storey parking garage is accessible from Lebuh Farquhar. Street parking is also available in front of the hotel.